Knowing how many brackets to shoot is clearly an important factor in high dynamic range (HDR) photography. It provides the much-needed information of where to start manual bracketing and how to configure (if possible) AEB on your camera. Finding the right answer to this question depends on several things. The dynamic range of the scene, the capabilities and limitations of your gear, and your personal style all play a role. The dynamic range of the scene: Three exposures shot at -2/0/+2 EV can handle most scenes. Scenes with the sun, white clouds, bright reflections off water, metal, or buildings, might require more underexposed brackets, and scenes with very dark areas (either in shadow or because of the light) need more overexposed brackets. A very high dynamic range is shown in this figure. In this case, the sun presents a very strong light source, and the dark shadows along the tree line are at the opposite end of the spectrum. Such a scenario calls for more brackets if you can shoot them. If you can’t (or don’t want to) shoot more, you’ll clip (exposure data goes off the scale in either direction, getting cut off and lost) lows or highs. 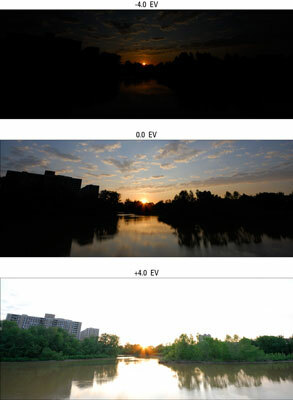 If using exposure compensation, you’re limited to an EV range of +/-2.0 EV. This effectively limits the number of brackets you can reasonably take. If using AEB, you’re stuck with how many brackets you can program the camera to take. Often, this is only three. Some cameras can shoot more. Alternatively, you can take multiple bracketed sets (centered on different center exposures) or revert to manual brackets. If using manual mode, you’re limited by shutter speed and aperture. If the scene is very bright, you might not be able to shoot fast enough (say, 1/4000 second or faster) at f/8. You might have to stop-down (decrease the aperture by increasing the f-number). For example, the dark exposure in this figure (taken with a Nikon D200) was shot with a shutter speed of 1/2500 second, well beyond what most compact digital cameras can take at f/8. Comparatively, the Panasonic Lumix LZ8 maxes out at f/8 and 1/2000 second in manual mode. Because its aperture can’t get any smaller and the shutter speed can’t get any faster, that photo is beyond the capabilities of the LZ8. Your style: Some photographers don’t deviate from three brackets at -2/0/+2 EV. It’s their style. Some like five brackets at +/-1.0 EV or some other combination. That’s the great thing about artistic freedom: It’s free. This table summarizes the rationale for choosing a specific number of brackets. 2 Being different; fewer shots to process. Most AEB modes will not shoot 2 brackets. effective at +/-1.0 EV and under. large dynamic range shooting +/-2.0 EV. shooting manually (forget about moving objects like clouds). As you get more experience shooting HDR, your own bracketing pattern and preferences emerge. You might settle on using three exposures, for example, separated by +/-2.0 EV. That serves as your baseline, which you can modify or extend based on the conditions at the scene.